Preliminary design for the U.S. Postal Service stamp honoring the late Sally Ride, America's first woman in space, to be issued by the postal service in 2018. America's first woman in space will become only the second NASA astronaut to be honored on a U.S. postage stamp in 2018. Sally Ride, who made history launching aboard the space shuttle Challenger in June 1983, will be depicted on a U.S. Postal Service (USPS) stamp. A preliminary design for the commemorative shows a painted portrait of Ride from the time of her first spaceflight set against the partial backdrop of the space shuttle lifting off. Another of the 2018 stamps employs the outline of NASA's Apollo spacecraft in a collage symbolizing "Engineering" in a four-stamp set dedicated to STEM (science, technology, engineering and mathematics) education — a cause Ride championed in her years following her two space missions and leaving NASA. "As a young girl, Sally collected stamps. She would be so honored to now appear on a stamp!" Tam O'Shaughnessy, Ride's life partner, said in a statement issued by Sally Ride Science, a non-profit Ride and O'Shaughnessy co-founded to promote learning and careers in STEM. "It was a great pleasure working with the Postal Service on the Sally Ride commemorative stamp," she added. 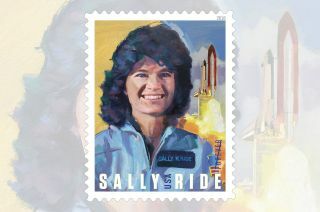 The Sally Ride stamp's release comes five years after her death in 2012. Criteria set by the Citizens' Stamp Advisory Committee, the group that recommends stamp subjects to the USPS, precludes living individuals from being honored on U.S. postage stamps. One of four stamps in the U.S. Postal Service’s 2018 "STEM Education" set uses an Apollo spacecraft to represent engineering. Ride is the second U.S. astronaut to be commemorated on a USPS stamp. In May 2011, the postal service released a stamp depicting the late Alan Shepard, the first American to fly in space and the fourth human to walk on the moon. Shepard's commemorative was issued as part of a pane of two stamps, the second celebrating NASA's MESSENGER spacecraft as the first to orbit the planet Mercury. Shepard was one of the original seven Mercury astronauts selected in 1959. Ride and her four crewmates deployed two communication satellites and carried out experiments over their six days in space. Ride's second mission, STS-41G, also aboard Challenger, deployed the Earth Radiation Budget Satellite, conducted observations of Earth and demonstrated potential satellite refueling techniques. It also marked the first time that two women flew in space together; Kathy Sullivan joined Ride as part of the crew. Alan Shepard, the first American to fly into space, became the first NASA astronaut to be honored with a U.S. Postal Service stamp in 2011. In total, Ride logged 14 days and 8 hours in space, circling the Earth 230 times. After retiring from NASA in 1987, Ride went on to become a professor of physics at the University of California, San Diego, and authored several science books for children. In addition to the 2018 postage stamp, Ride has received several posthumous honors, including the christening of a U.S. naval research ship in her name; the awarding of the Presidential Medal of Freedom, the nation's highest civilian honor; the naming of a NASA spacecraft impact site on the moon; and last month, her inclusion in a new set of LEGO minifigures celebrating the "Women of NASA."